We surveyed 1,000 consumers in our annual report on access trends and found a growing demand for convenient, high-quality care. As competition rises from both traditional and emerging sites of care, opportunities exist for health systems to differentiate their brands by addressing fracture search experiences and removing scheduling barriers. Today’s healthcare consumer is looking for more than a clinical match, she is looking for a convenient option tailored to her preferences. This white paper advises how health systems can optimize patient-provider matching by factoring in patients’ clinical needs, logistical requirements, and personal preferences, to move the needle on patient access and avoid losing patients to competitors. Reducing barriers to schedule a patient’s follow-up care with the optimal in-network provider can go a long way to improve patient retention, satisfaction, and care coordination. We surveyed 100 PCPs and 100 specialists across the US to understand their referral tendencies and identify opportunities to improve patient-provider matching as providers look to keep patients within the health system network. Patient experience is a leading priority for many health system leaders, however, most organizations lack visibility into the key metrics they need to evaluate and enhance patient access moving forward. 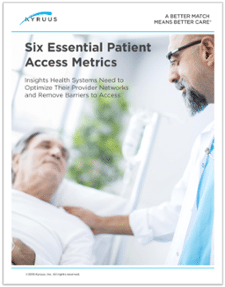 This white paper defines the six metrics health systems should track and provides actionable ways to improve access through visibility into the health system network. Visit our Resource Center to access this content and to learn how to power your organization’s transformation in 2019.